Chota, based in Knoxville, Tennessee was founded by a fly fisherman who also happens to be a great designer. His name is Frank Bryant. I remember when Frank would bring prototypes by the shop to show me years ago. Then, after that he headed to the mountains to test them. Frank started with paddling shoes and accessories. Then he began his journey in the fly fishing business. First came wading boots. Then one day he walked in the store with a wader prototype. He would call it the Abrams Creek, named after a local river near Cades Cove, 9 miles from here. Other models would follow with improvements to both the original model and the new gear. And we kept selling these waders to customers just like we did with his boots. In May of 2011 Frank showed me what would become the Hippie, a stockingfoot hip boot. This one would be special. It has a special name too. I even filmed and edited a short “Hippie” video for Chota that you can view on YouTube. I bought a pair immediately. I like fishing for smallmouth bass in the lower Little River. The Hippies were perfect for me and many other anglers around the world. That’s right. We have shipped them to other countries, to anglers like you who heard of this great new hip wader. 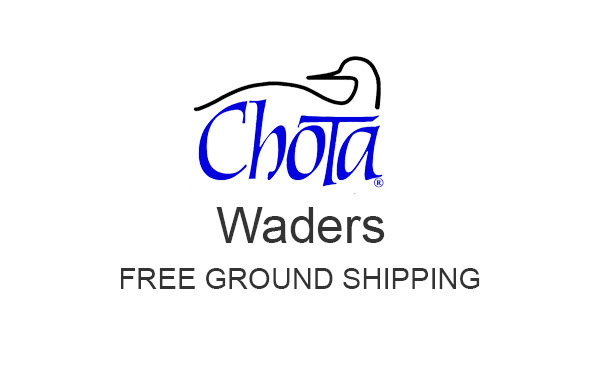 So enjoy looking at the Chota wader department and also check out their wading shoes on this website or theirs. I have three pair of waders in my fishing room closet. All three are Chota waders. Those waders are the ones I use. My wading boots are also made by Chota.